Last Saturday we had a great time fly fishing with “The Hill Gang.” These anglers had to deal with really low water, clear skies and bright sunshine which made the fish a little spooky. Regardless they caught a bunch of very nice Rainbow Trout like the one Tony is holding in the photo on the right. 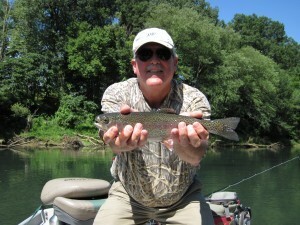 Most of the fish were taken on #18 Black Zebra Midges and #16 Crispy Creme Sowbugs. 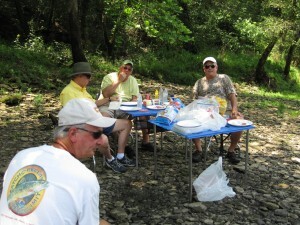 As with any group of good friends, it is not all about just catching fish, and the guys enjoyed a great shore lunch and had a great time talking about all the fly fishing trips they have made together over the years. Good friends, good food and great fly fishing.